Across Chicago museums and cultural institutions, 2018 has been a year to celebrate the city’s achievements in art and design. The Terra Foundation for American Art has partnered with Chicago cultural organizations on more than thirty exhibitions and one hundred events that look back at the artists, neighborhoods, moments, and developments that have shaped the city. Art Design Chicago encourages both cross-city exploration as well as celebration of the hyperlocal, with participants that encompass the Art Institute of Chicago in downtown, the South Side Community Arts Center in Bronzeville, and Northwestern University in Evanston. In Pilsen, Arte Diseño Xicágo, presented by the National Museum of Mexican Art (NMMA) takes a closer look at the histories of Mexicans and Mexican Americans in Chicago. Curated by Cesáreo Moreno, National Museum of Mexican Art (NMMA) chief curator and visual arts director, Arte Diseño Xicágo examines the artistic and cultural contributions of Mexican immigrants and artists in Chicago from the 1893 Columbian Exposition through the Civil Rights era. This curatorial focus explores historical subjects both familiar and lesser known, including extensive original research. In many ways, Arte Diseño Xicágo tells the story of Chicago’s Mexican and Mexican American community leading up to the 1980s and provides historical context for the National Museum of Mexican Art. The institution was founded in 1987 with a mission “to showcase the beauty and richness of Mexican culture by sponsoring events and presenting exhibitions that exemplify the majestic variety of visual and performing arts in the Mexican culture; to develop, conserve and preserve a significant permanent collection of Mexican art; to encourage the professional development of Mexican artists; and, to offer arts-education programs.” Arte Diseño Xicágo features objects including photographs, artifacts, and artworks by more than thirty artists. Chicago and its surrounding suburbs are currently home to a population of more than one million Mexicans and Mexican Americans, yet it is a common misconception that most are recent immigrants. Arte Diseño Xicágo traces the history of Chicago and the intercultural exchange with Mexico back to the 1893 World’s Columbian Exposition, often referred to colloquially as the World’s Fair. The exposition and its tremendous impact on Chicago and the United States have been the subject of much scholarship, but public exhibitions and presentations have often focused on popular subjects from a distinctly American perspective. Arte Diseño Xicágo capitalizes on the popularity of the fair as a historical subject and uses that as a means to instead focus on the presence of Mexico. The exhibition explains that Mexican president Porfirio Díaz recognized the potential for World’s Fairs to transform international perceptions of a country and worked with his advisors to craft a visual narrative of Mexico as a modern, flourishing country. In Chicago, their efforts were recognized with more than eleven hundred awards and the interest of numerous foreign industries. The expansion of the railroad throughout Mexico and into Texas would later spur the first wave of Mexican immigration and travel to Chicago. Throughout the exhibition, key figures and organizations from Chicago and Mexico are highlighted and often interwoven in the historical narrative. One notable featured artist was Enrique Alférez, who had fled to Texas as a young boy during the Mexican Revolution. While working as a photographer in El Paso in 1923, he heard a lecture by the prominent Chicago artist Laredo Taft, who urged him to move to the city to study at the Art Institute of Chicago. Alférez lived at Taft’s studios with other apprentices and was exposed to the skyscraper boom and the emergence of Art Deco design. Arte Diseño Xicágo features several sculptures by Alférez, who later moved to New Orleans, where he worked for the Works Progress Administration (WPA) and created numerous civic monuments and sculptures. The exhibition primarily focuses on his sculpture, although he also worked in bas-relief and woodcarving, all done in a realistic yet distinctly Art Deco style. Many of the Mexican immigrants to Chicago in the 1920s were in some way connected with Hull-House, which was a social settlement cofounded by Jane Addams that provided social services for workers, including English classes. Hull-House sought to assist new immigrants with cultural integration and assimilation; however, they also celebrated Mexican traditions. Addams herself had traveled in Mexico and familiarized herself with the culture and crafts. Arts and crafts workshops became an integral component of the Hull-House programs and appealed to many of the former agricultural workers who had experience with some of the materials and tools. Arte Diseño Xicágo makes clear that many of the craftspeople would not have identified as fine artists, but the incorporation of Hull-House and the ceramic and decorative objects created in its workshops into the exhibition serves to support an expanded vision of Mexican influence on Chicago visual culture. 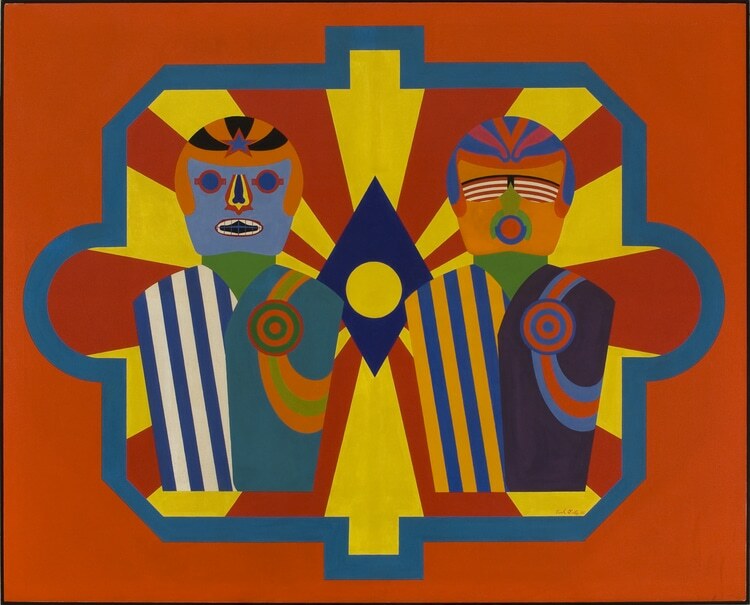 Though much of Arte Diseño Xicágo focuses on lesser known artists, Chicago Imagist Errol Ortiz had several works included. Ortiz was born in Chicago and studied at the School of the Art Institute of Chicago. Ortiz did not begin to work with Don Baum and the Imagists until he returned from an extremely influential six-month stay in Mexico. Ortiz exhibited throughout Chicago with the Imagists for decades, yet his first museum solo exhibition was at the NMMA in 2016, and it featured a selection of his vibrant, surreal Pop paintings (fig. 1). Cultural organizing and self-taught artistry are featured throughout the exhibition. Maria Enriquez de Allen, a former field worker who moved to Pilsen and began teaching arts and crafts, is introduced as a central figure within the Pilsen community in the 1960s. She was a former migrant farmworker who arrived to Chicago as a widow with seven children and quickly became involved with coordinating cultural events and teaching community art classes. Her youngest son, Mario Castillo, would later study at the School of the Art Institute of Chicago and was greatly impacted by early exposure to the WPA murals and Chicago labor history. Amid the political and social turmoil of 1968, he was inspired to paint Peace (also known as Metafisica), the first Chicano/Mexican American mural in the United States. Arte Diseño Xicágo commemorates this major yet underrecognized development, drawing attention to the importance of community artists. A significant inclusion in the exhibition is the video A Casa Vieja, Puertas Nuevas: Los Early Days en Casa Aztlán. The oral history project features interviews and documentary footage of many of the key figures involved with Casa Aztlán, a community center in the heart of Pilsen that operated for over forty years. The façade of Casa Aztlán’s building, a colorful mural honoring Mexican and Latin American culture and heroes, became synonymous with Pilsen after it was painted in the early 1970s. The center closed its doors in 2013, but the murals remained until 2017, when the new owner of the building painted over them. After substantial community outcry and protest, the developer worked with Ray Paltan, the original mural painter, and a group of local artists to repaint the façade. Casa Aztlan’s inclusion in Arte Diseño Xicago serves to remind visitors of the impact of gentrification on the Pilsen neighborhood and the importance of preserving Mexican cultural heritage in Chicago. The National Museum of Mexican Art views Mexican culture as one sin fronteras, or without borders. In attempting to create bilingual and multicultural exhibition content that engages a wide array of audiences, the museum has created an expanded definition of the Mexican identity. Although the museum is not incredibly large or encyclopedic, it holds a vision that contemporary knowledge of Mexican identity is contingent on reflection. Many of the rotating exhibitions focus on contemporary Mexican and Mexican American artists, and Arte Diseño Xicágo encourages viewers to connect the past and present for a greater understanding of the history and culture of the city. Cite this article: Mia Lopez, review of Arte Diseño Xicágo: Mexican Inspiration from the World’s Columbian Exposition to the Civil Rights Era, National Museum of Mexican Art, Panorama: Journal of the Association of Historians of American Art 4, no. 2 (Fall 2018), https://doi.org/10.24926/24716839.1679.